Analyze and minimize causes for machine downtime in ALL types of manufacturing equipment (including legacy machines) with a downtime tracking, machine monitoring and production tracking system. Reduce manufacturing downtime with Machine Data Transducers (MDT), and supporting Windows software with machine monitoring, downtime tracking, production monitoring and manufacturing OEE dashboards. MDTs connect directly to ANY production machine’s electrical operating controls to collect machine downtime, production, performance and manufacturing OEE data. 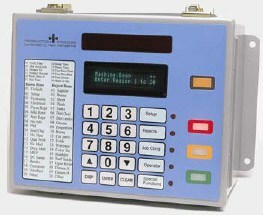 MDTs automatically record downtime, and can either prompt the Operator to enter the reason for the down event, or record downtime in multiple reasons from direct machine connections. Similarly, rejects are tracked automatically from direct machine connection(s) and from keypad Operator Input. Three models of MDT with up to 40 downtime and 20 Reject Reasons enable you to match MDT features to individual machine functionality for economical, automated equipment downtime tracking. 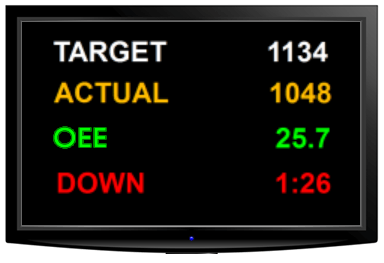 Plant floor and remote Production and Manufacturing OEE Scoreboards keep Operators productive and managers informed of reasons for stoppage, slowdowns. Low cost, large screen TVs display your choice of Key Performance Indicators such as individual machine downtime and its cause, defect counts, OEE, cycle time, production rate, etc. Displays are color-coded to draw immediate attention to machine status and operating conditions. 1. Replace inaccurate manual methods with automated machine downtime tracking. It is difficult enough to manually record long stoppages, but it is impossible to track the small stops that typically go unnoticed, but have a significant effect on manufacturing productivity. With MDTs you accurately record ALL downtime. 2. See real-time status of each machine on production downtime dashboards at the machine, and throughout the enterprise on system PCs. Here’s one of two data screens that display the total downtime and number of down incidences in each of up to 40 Reasons (the number of reasons depend on MDT model). React in real time to issues on the floor, rather than finding out at the end of shift, the next day……..or never. 3. Send automatic e-mail alerts to managers when specific production downtime reasons occur. 4. Use equipment downtime analysis to find causes of productivity losses not directly due to the machine: compare operators, products, materials, machine, tooling, molds, etc. For example, some products or materials run better on different machines. Some models of MDT provide operator log-on capability, so you can monitor performance to determine if an Operator needs more training. 5. Use Downtime Reason Pareto reports to simply and graphically convey information to personnel. (Review video for more information). A powerful tool for production downtime analysis, the ProductionACE machine downtime tracking system generates downtime Pareto reports to graphically and effectively communicate specific problems—and the progress made in solving them—to any employee, from line operators to senior management. 6. Review historical machine downtime analysis data to establish benchmarks to track progress of Continuous Improvement initiatives. Establish baseline, accurately document continuous improvement programs, utilize historical data to analyze manufacturing downtime over a user-selected interval, sorted by Machine, Cell, Line, Shift or Operator. 7. Record, analyze then optimize individual steps involved in production machine setup and job change processes. Some MDT models provide the ability for operator/maintenance staff to segment a single down event into multiple operations. The down reason can be manually changed as each step in the Setup process is accomplished. 8. Minimize unplanned production downtime by implementing usage-based maintenance scheduling. 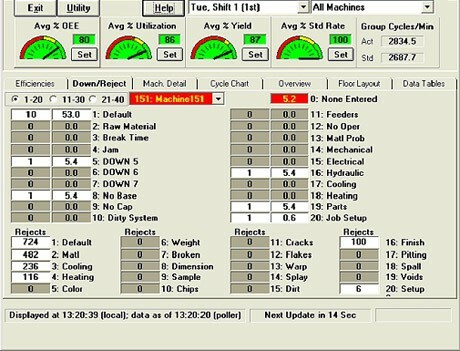 Replacing ineffective calendar scheduling, the system’s PM module will alert you to maintenance (“near due” and “due”) based on actual run time and cycle count on machines and associated components such as dies, printing plates, molds, etc. Each component can have a different PM schedule.